Villa San Giovanni is a spectacular villa located in the gated Orient Bay Village, within walking distance of St. Martin's famous Orient Beach. 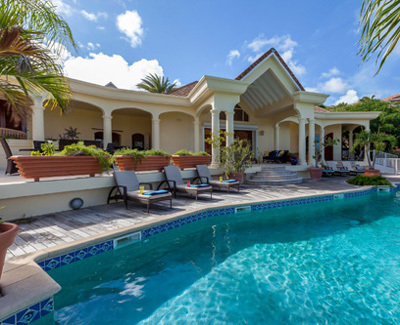 The Villa is perched on a hilltop with a stunning view of the islands of Tintamarre and Pinel, and a bird's eye view of Le Village de la Baie Orientale, an oasis of white sand beaches and colorful Caribbean homes. The villa has a magnificent master bedroom and bathroom including shower and bath tub. The 3 other bedrooms are in the opposite side of the villa and share 2 bathrooms with separated toilets. In one of these bedrooms, there is a mezzanine and an additional queen size bed, so the villa can accommodate 10 persons. Ideal for big families, the spacious living and dining rooms open onto the expansive and airy pool area surrounded by beautiful gardens. The living area is equipped with satellite TV, a DVD player, a CD player and internet access. Villa San Giovanni is at less than 10 minutes walking distance from the beach, restaurants and shops.